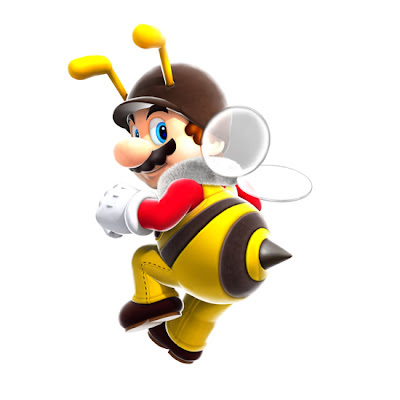 Originally appearing in Super Mario Galaxy, the Bee Suit allows its wearer to temporarily hover up into the air. A circular air gauge pops up on the screen which slowly loses wedges. When all of the wedges disappear, Mario must land. Just don't be crossing a chasm while this happening happens! Bees apparently don't like water as coming in contact with the substance takes away the suit's powers. The power-up representing Super Mario World, my personal favorite 2D Mario, the Cape power-up was symbolized by a brown and white feather. 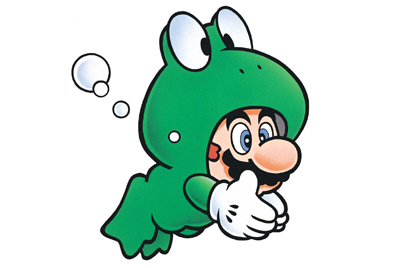 When collected, Mario would sprout a cape on his back. 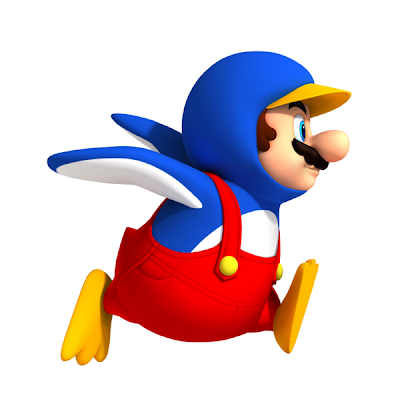 With enough of a run, he could soar into the sky and use the cape as a parachute, zipping through the air. Advanced players could abuse this feature, utilizing the parachute's power to bypass entire levels. But you wouldn't do something like that, would you? Super Mario Galaxy 2 is one of my favorite games of this generation, and it won SuperPhillip Central's Best of 2010 Game of the Year award. 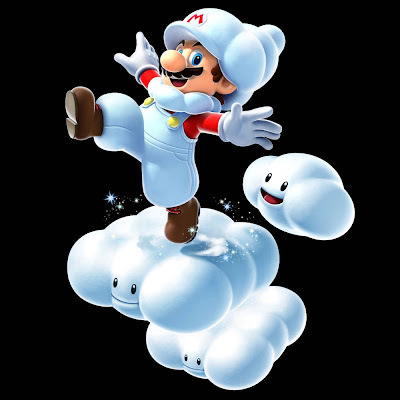 Accolades aside, the Cloud Suit bestows its wearer with the option to conjure up cloud platforms to walk safely upon. Only three clouds can be summoned at a time. Each time a new platform is made after three have already been manufactured, the oldest cloud disappears. Cloud platforms can be blown by fierce winds and carried to far away locations. How does one make clouds? Just shake the Wii remote and bam! There it is. The quintessential power-up originally appeared in Mario's first full-fledged adventure. 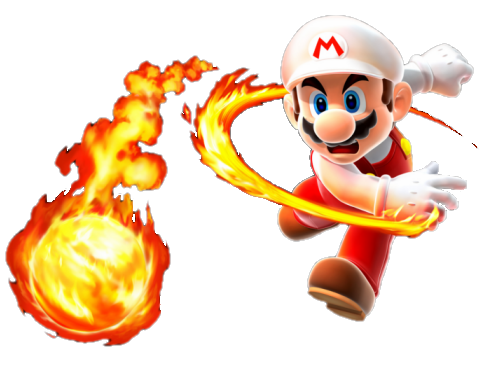 Mario's shirt would turn white, his overalls would transform into a burning red, and his hands could launch a heated array of fireballs. These aforementioned balls could bounce off walls, and they'd put a thorn in Bowser's side as five fireballs would be enough to do the koopa king in. 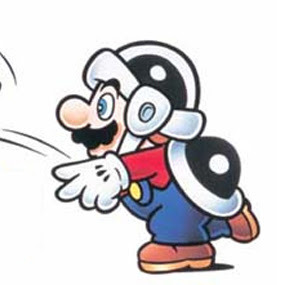 In Super Mario World when Mario performed a spin jump, two fireballs would propel themselves from his hands, one going left, one going right. The latest Mario platformer, Super Mario 3D Land, utilizes the fire flower, and it works just as well in 3D as it did in 2D. Now that's progress! The ultimate in underwater acrobatics, the Frog Suit allows its wearer to effortlessly swim through oceans, flooded passageways, and channels like some amazing amphibian. Pipes that shoot out a heavy current of water are no problem for Frog Mario! The suit has enough strength to fight the current, swimming into these pipes like they were nothing. The pinpoint precision offered by this suit underwater is immeasurable in its usefulness. Levels where accuracy is required (Bloopers all over the place, Cheep-Cheeps swimming in perilous patterns, Big Bubba ready to smash into Mario, etc.) the Frog Suit is paramount. It's a waterlogged plumber's best friend. 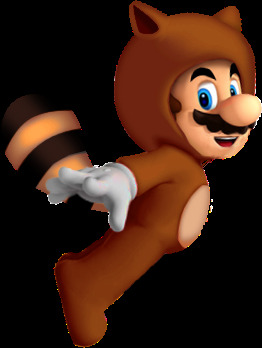 The newest suit in Mario's many adventures, Super Mario 3D Land's Boomerang Suit gives Boomerang Bros. a dose of their own medicine. Players can only launch one boomerang out at a time, but one is plenty. 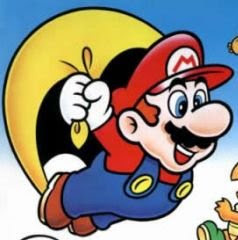 Mario can jump over the boomerang as it wafts back and forth, killing enemies. Defeat five enemies with a single boomerang, and you earn a 1up. Every consecutive enemy defeated afterward adds more 1ups to Mario's tally of lives. One of two suits that debuted in New Super Mario Bros. Wii, the Penguin Suit lets the wearer shoot balls of ice from their hand. These balls freeze foes upon contact. The frozen enemies can then be used as a makeshift platform or picked up and tossed. As a penguin, players can slide on their bellies under low ceilings to otherwise inaccessible areas. Whether freezing or sliding the Penguin Suit is a force to be reckoned with. 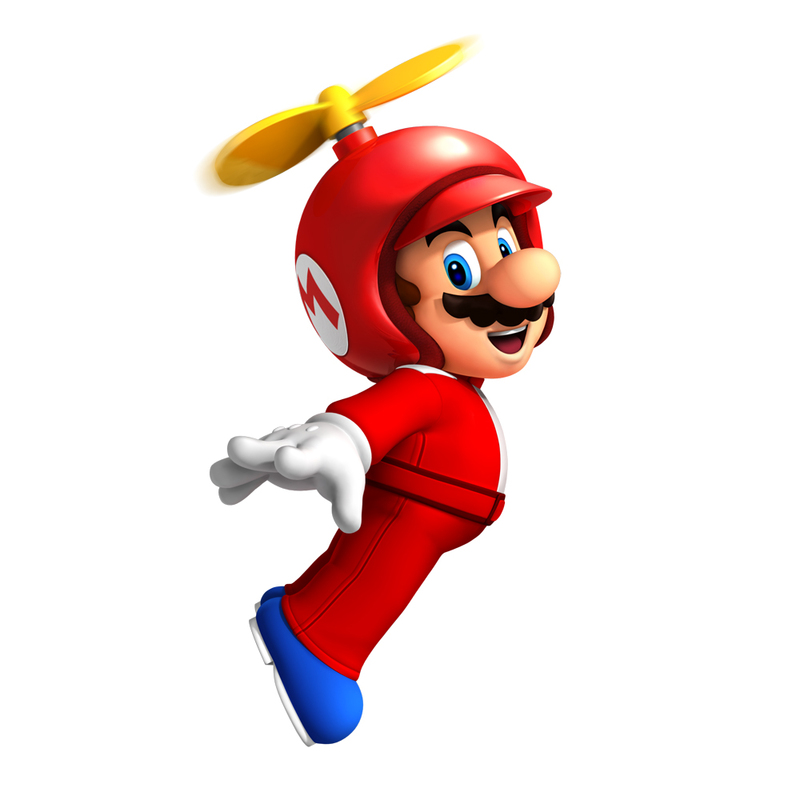 The other of two suits introduced and featured prominently in New Super Mario Bros. Wii, the Propeller Suit gives those who don its goofy helmet and costume the ability to shoot up into the air and slowly descend to the ground. This action is performed by the player with a flick of the Wii remote. There is nothing like gaining big air, leaping on the heads of unknowable prey, and racking up some serious points. Those darned Hammer Bros. are going to be the death of me! Well, not if Mario can get to them first! Use their own weapons against them. Why not? Fair is fair after all. The Hammer Suit allows Mario to chuck an endless supply of hammers and mallets at foes. This suit isn't just for offense either. 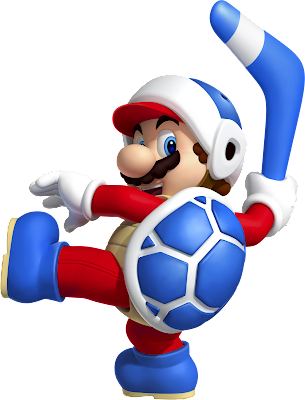 By crouching Mario can curl up under the suit's shell, blocking most attacks by enemies such as fireballs. Now that is some ingenuity! Not only is the suit wonderfully useful and rare, but it is just supremely cool to gawk at. Through Mario's many adventures he has gathered plenty of power-ups and worn many suits. There are a vast amount that did not even make the list. How could I not mention Metal Mario with his infectious theme? Was bouncing high into the sky as Spring Mario not good enough for this list? Apparently not. Regardless of your opinion toward the matter, as long as there are koopas to thwart and Bowser's plans to mettle with, there will be power-ups to collect and suits to don. What about you? What are your favorite power-ups/suits? Have you picked up a copy of Super Mario 3D Land? If so, what are your initial impressions regarding the game?